If you've been pining for a high-end Android gaming tablet with a high resolution screen then you might want to hold off on buying a new gadget until a tablet with the new Nvidia Tegra K1 chip hits the market. Tom's Hardware and WCCFTech spent some time with a few of the prototypes running on the Tegra K1 chip, and earlier today they posted the benchmarks. If you're looking for a powerful work tablet then this chip might not be worth the wait, but if you're into hard-core gaming or you want the best hardware on the market, read on. Nvidia’s new Tegra K1 chips will be the first to bring better-than laptop-class Kepler graphics to mobile devices like tablets and smartphones. The chips have 192 graphics cores paired with some of the fastest ARM-based processor cores available, making them potentially the fastest chips on the market. While this is just one way to measure a chip's performance, when it comes to gaming this is an important yardstick. 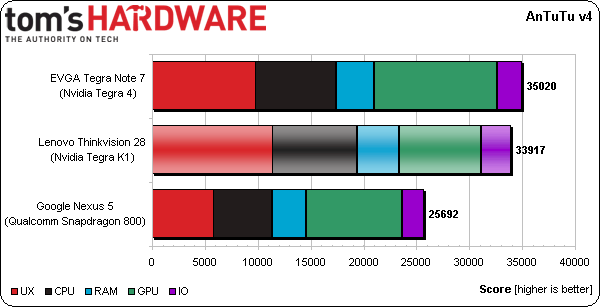 But it's not the only yardstick, and that's why I'm glad that Tom's Hardware posted other benchmark results. On one test (Futuremark 3DMark) the Tegra K1 was easily the fastest chip, but the results for a couple other test were more ambiguous. They showed that the Tegra K1 chip was much more capable in theoretical terms (the offscreen tests) than in practical terms (when it was driving the 3840 x 2160 resolution screen on the Lenovo ThinkVision 28" Android-based monitor). I'm still trying to decide if those results mean that this chip is really as powerful as they say. Yes, the theoretical results show that this chip is much better, but if you can't see a similar performance when using the actual device then it doesn't really matter. At this point I think the offscreen tests are probably the better yardstick. The devices used for these tests are not the polished and finished designs that will hit the market later this year, and that means that the practical scores for the commercially released hardware should be higher than what we see here. But I would not expect all of the future benchmark test to show a better result For example, the Antutu benchmark shows that while the Tegra K1 chip is a great graphics chip, it's not all that well-rounded. This test measures all the basic abilities of a chip, and not just the graphics abilities, and it shows that the Tegra K1 was out pointed by the Tegra 4 chip running the Tegra Note 7. 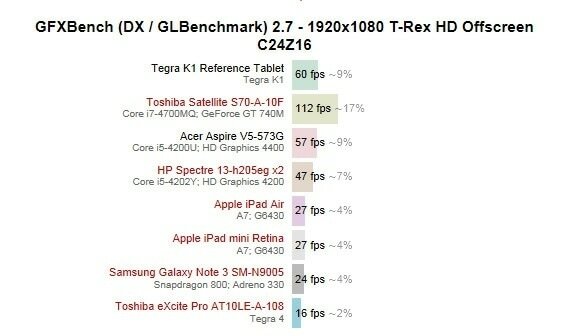 The Tegra K1 did outscore in a couple areas but it's not a clear winner overall. But no matter how much the scores improve, I don't think I will be getting one of these tablets. I'm not into heavy duty gaming, and I'm not expecting to want a tablet with a super-high resolution screen like the Lenovo ThinkVision mentioned above. My purposes are well-served by tablets based on much cheaper quad-core and dual-core chips. Not sure what you did there ,if intentional or not. The Lenovo has a 4k screen , so ofc in on-screen testing it is slow since it has to push 4 times more pixels than in a 1080p phone and 11.4 times more than the iphone. Off-screen compares at 1080p to avoid differences in resolution but it doesn’t mean it’s not accurate,it just compares the GPU on equal terms. In Antutu it seems that the GPU bench is native res not offscreen and if you actually look at it you can clearly see that the GPU score is the only one lower than T4. As for the WCCFTech test , the K1 seems capped at 60FPS so we don’t know how much it can actually push in this benchmark. Anyway ,at this rate in a couple of years mobile SoCs might match the new Xbox in GPU. Thanks for catching the detail about the ThinkVision. I fixed it. And yes, I do know that the Tegra K1 was driving a lot more pixels than smaller devices like a smartphone. the point I was trying to get at was that the much more powerful chip was effectively less capable than other chips because so much of its ability went to support the screen. Those other devices might have a weaker chip but chances are they could have a noticeably better performance than the Tegra K1 – if the Tegra K1 has to support a screen like the one on the ThinkVision.